For this final post in the short season of posts about the UK Puzzle Championship, everything I say below should be taken as being less important than a hearty vote of thanks to everyone at the UKPA for putting the championship together year after year, from the puzzle authors to the test compilers to the system administrators. It’s easy to criticise a puzzle contest when you feel that you did worse than you deserve because puzzle styles at which you are particularly strong are, in your view, underrepresented. I’m going to do something different; I’m going to criticise this year’s UK Puzzle Championship for overrepresenting puzzle styles at which I was relatively strong. This time, I did relatively well by being able to apply variants on one technique to several different puzzles. There were a lot of puzzles which essentially relied on adding together a subset of integers 1+2+3+…+n, for some value of n, to meet a given total. (Or, nearly equivalently, adding all those numbers together and deducing what must be missing to reach a given total.) The same technique was required for Bank Note, Last Digit, Sum Skyscapers, Kakuro (more or less) and Sumpix. Some years some puzzle styles are heavily represented; other years, other puzzle styles get lucky. 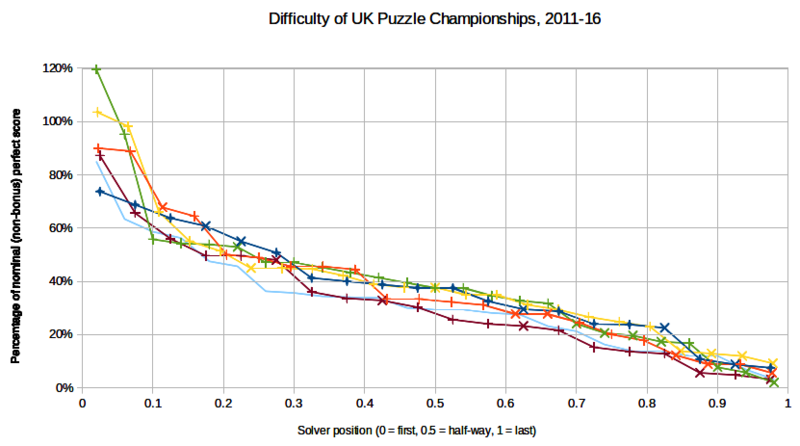 I don’t think it’s possible for there to be a reference distribution of puzzle styles (which might look like “one of these, one of those, one of the other…”) against which a UK Puzzle Championship would be measured. It’s one of the joys of the world of puzzle competitions that the constituency of possible puzzles from which source material can be drawn is so wide. The closest to a taxonomy of (even only culture-free, language-neutral) puzzles that springs to mind is a classification put together by Dr. Tom Synder’s The Art Of Puzzles: “number placement puzzles (such as Sudoku and TomTom), object placement (such as Battleships and Star Battle), region division (such as Fillomino and Cave), shading (such as Nurikabe and Tapa), path/loop (such as Slitherlink and Masyu)“. That page gives plenty of other examples of puzzle styles that fall into each of those broad categories. It’s also key to note that even that page notes the number of other puzzle styles that don’t meet that categorisation. Alternatively, look at Mike Selinker and Tom Synder’s amazing Puzzlecraft on puzzle construction, which considers the wider world of puzzles at large; by a certain definition of the purpose of the UK Puzzle Championship, it would be reasonable for the UK Puzzle Championship to focus upon the culture-free language-neutral puzzles that are the World Championship’s focus. I take a stronger view than most that the UK Puzzle Association should be using the potential to take part in the World Puzzle Championship as a very strong attraction and should be promoting that at every opportunity. Furthermore, I take the (somewhat radical) view that team selection should be through as many different routes as possible, so that more events can be promoted as qualification opportunities as excuses to get the word spread far and wide. I would promote this ahead of the apparent patriotism of making the UK Championship (and the in-person UK Open Championship) as important as possible. Further still, I would go further than most (though not all the way!) towards prioritising using the UK Championship as an awareness-raising tool over using it to be discriminatory at the elite end to crown a champion. 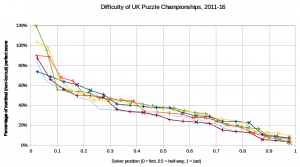 There have been six UK Puzzle Championships to date; the above graph compares anonymised solvers’ performances on them. The dark blue line represents performances in 2011, the orange line in 2012, the yellow line in 2013, the green line in 2014, the brown line in 2015 and the light blue line in 2016. The horizontal axis represents the position of the solver relative to the cohort (the best performing finisher far left, the worst performing finisher who scored at least one point on the right, the median solver midway and so on) and the vertical axis represents the score of the solver, expressed as a percentage of the nominal perfect score assuming no bonus. Accordingly, an all-correct solution with a time bonus earns more than 100%. It’s clear that the 2016 competition was relatively difficult, or at least that the quantity of material on the paper was rather higher than in the two previous years. The raw number of points possible were rather higher this year than in previous years; it’s not clear that a, say, 15-point puzzle this year directly correlates to a 15-point puzzle in previous years. The spread of point distributions between relatively low-valued and relatively high-valued puzzles varies considerably from year to year, too. 1) Every year from 2011-2015, there has been at least one top-six solver who hasn’t participated in future years. While you can’t make people participate if the date and time don’t suit, or if their interest in UKPC puzzles has waned, the potential UK team at the WPC would surely benefit strongly from their participation in the UKPC – and I would recommend proactively reaching out to them individually. 2) If you finish in the bottom 20%, you are no more likely (and, in three of five years, strictly less likely) to participate than not to participate in future years. Speaking as a self-certified, long-established “crap ‘un”, there have been years where I’ve been practically (and at least one year where I’ve been literally) the only bottom-feeder to come back and participate in future years. Now perhaps this would have less of an impact on the potential UK team at the WPC, but it doesn’t strike me as an indicator of robust health from metaphorical nose to tail. The logic puzzle competition hobby in the UK has an unusually skewed distribution of skill levels. We are fortunate enough to have very strong solvers at the top end. The standard of the best solvers, around the world, is improving over time. (Conversely, the highest end of championship play requires increasingly difficult puzzles over time.) The dear Croco-Puzzle site once did an experiment by posing the same, otherwise unremarkable, series of daily puzzles a couple of years apart, and noted an improvement in performances over time. The standard of the UK’s best solvers varies from year to year, but we certainly have very strong solvers at the top end. I tend to believe that a championship with the same cohort of top solvers at the top end, similar mid-tables and a rotation in the lower order, who try a championship and largely decide that it’s not for them rather than sticking with it and (hopefully!) improving over time, does not represent strong health. There are other mind sports which spring to mind, where there are competitions with the same, very few, extremely strong participants again and again, and no real infrastructure for the less accomplished to play and improve. I do tend to believe that strong participants are made rather than born, simply by the degree of practice that the best solvers put in. On the other hand, they tend to be found rather than produced; perhaps my biggest hope is that some more people with the UKPC sort of smarts and a strong sense of competition find the championship. I’d really like to try to tap into the well-established mathematics competition infrastructure that keeps the best solvers engaged before university… but relies on university to give them chances to compete after that. Where do past International Mathematics Olympiad students go for their competition fix? In theory it could be the (seemingly similar) International Mathematics Competition for University Students, which happens to be in progress in Bulgaria this week, but in practice it doesn’t seem to be that way for UK universities. Certainly there have been some past IMO participants who’ve translated to the WPC very well; I’d love to try to grab other UK IMO team members to try out for the UKPC, if that were their sort of fun. That said, the logic puzzle competition hobby is so much better off than it once was; originally, the season was just a single qualifying competition long – and up to 2010, the UK used the unforgiving US Puzzle Championship as that qualifier. The addition of the WPF’s Puzzle Grand Prix represents a considerable improvement, with relatively accessible puzzles included in every contest and a less-daunting 90-minute duration. The addition of the “casual” division to the WPF Puzzle Grand Prix papers represents a second considerable improvement to accessibility, even if it’s an experiment which might not quite have turned out in the way that was intended. I’ll emphasise again that I offer profound gratitude to everyone at the UKPA for putting the championship together year after year; at the end of the day, it’s for the UKPA to decide their priorities and for them to devise a championship to do what they want to do. I’m not a UKPA member, not least because I know my opinion on this matter is an outlier, and I think it works well for them to do their thing and for me to do my thing separately. There are, after all, many, many little separate puzzle hobbies – and, by and large, they’re all happy keeping themselves to themselves and doing their own little thing. (Which is not the way I would like it to be, but there is much in life that fits that description.) And yet if there’s one situation where one little self-contained puzzle hobby could do with making itself known to other little puzzle hobbies and trying to tap smart people who throw time and effort into puzzle hobbies, it’s for the purpose of trying to get a strong UK puzzle team together. At heart, this is a big part of the reason why I want to try to bring the little puzzle hobbies together, to try to get more brilliant people trying out for the UK team. To me, a big part of the aim should be to get new people involved, and that should include a strong representation of familiar puzzle styles, including “casual” puzzles (as opposed to grid-based Constraint-Satisfaction puzzles) such as picture puzzles, wordsearch-style puzzles, numerical puzzles, crossword-style puzzles and insight puzzles, at a genuinely accessible level of difficulty. This year’s UKPC did fit that bill to a limited extent and the UKPC – while I’ve seldom (if ever?) enjoyed it more than I did this year – certainly has done better in this regard in previous years. I’d like to see future UKPCs make that a higher degree of focus, while still remaining the ability to discriminate between the most capable and experienced solvers at the top end of the competition. I can’t speak for the UK specifically, but I have been trying to introduce people to WPC-style puzzles for quite a while; please allow me to vent in rough agreement. A reference distribution exists for WPCs in the form of a table with lines like “0-5% knowledge”,”5-15% perception”, “10-20% arithmetic” etc. It seems to be largely and foolishly ignored. I suspect the hobby has fallen prey to overfitting. And since solvers are also setters, it has resulted in a feedback loop that makes the puzzles both increasingly hard and increasingly alien. I had the pleasure of explaining the meaning of skyscraper clues to a UK journalist once. Or, strictly speaking, four times in four different ways till they made sense to him. The journalist was there for a world championship, and I wondered if I had any practice or competition puzzle he could fit and explain into his segment. I didn’t. I did have lots of puzzles with several paragraphs of rules though. I also suspect that the WPF heads feel the situation has gotten a bit out of hand as well, hence the casual section. But using the same authors as the other section led to puzzles that largely weren’t far enough from the rest, nor much easier. Also, an adult taking up swimming for fun will enjoy himself less under a neon KIDDIE POOL sign. Personally, and although it goes against my own skillset, I’d like to see puzzles in more media (electronic to origami, acrylic to string) in the live championships, and a lot more traditional puzzles in the online championships. Spot the differences, order the pictures, counting puzzles, weighing puzzles, simple and variant wordsearches, skeleton crosswords are all absolutely fine. They are also giving something to succeed at to the layman who doesn’t feel like getting the deeper meaning of four paragraphs of rules for the 20th time just now. So in a sense, I am describing the USPC as a model contest. Things being what they are though, the Indian model seems to be best for luring casual solvers with the promise of a title. A series of brief thematic online tests with easy to medium difficulty puzzles allows newbies to go for completion without straining the attention/ concentration span. Pros essentially compete on time, and at an offline final. If you want to swell the ranks though, the Chinese approach works I suppose, but Turkey is the one I’d want to emulate. Their WPF rep is a publisher who works extensively and in person at schools, organising presentations and contests. The results are beginning to speak for themselves. I don’t think the UK solver distribution is in any way unusual. It speaks exactly to my own experience. There are lots of people who don’t get the rules, and people who do but find it work rather than fun; these may give it a shot, but won’t come back. Then there are the process solvers, where adding speed just adds stress detrimental to fun; they often prefer to solve on a comfy chair with the radio on. These people are poorly served by contests, but their sheer numbers can make or break associations and publishers. And publishers are the best thing for such a hobby. Far as competitors go, you can get decent at this with the usual 5K hours of practice, but there’s no doubt in my mind that some people are just naturally faster. They are not many, and the first time you come across them is a wondrous/soul-crushing event. I have little experience with children solvers, so that “naturally” may reflect environment in some unknown way, but I have never been able to coach myself or anyone else to that level. Amusingly enough, the difference is more blatant on the easier end of the spectrum; the scanning heuristics and deductive patterns toolkit you built up over time allows partial catch-up at the deep end. So add 5 years of experience to a person you’d never play Set with, and you will get a world class competitor. Thanks for your comment! It is fascinating, you clearly know rather more than I do and I’d be keen to learn from you. How do other countries organise their qualification procedures? I’m familiar with the UK and US procedures and sort of know how the German one works. Swiss/Dutch/Japanese hold online tests on LogicMastersDeutchland/wcpn.nl/jppuzzles.com. The Japanese qualifiers are tomorrow! Poland has SFINKS which runs online preliminaries and in person finals . French run their own offline championships, their online presence is a bit shoddy. They also had some plagiarism issues a few years ago. India’s model has changed a few times, logicmastersindia holding their tests. Canadians used the USPC last time I checked. I don’t know about China,the people at sudokufans.org.cn can probably enlighten you. Greece used to have an e-mailable contest, but now uses the WPF GP rankings as qualifiers. This seems to be the process for most of the countries that can’t hold their own contests.